If you are looking in the rear view mirror, you are doing one of 3 things: (a.) Fearing whatever demons are chasing you; (b.) Dwelling on past mistakes or failures; (c.) Or admiring yourself and present situation. Either way, you cannot and will not move forward by looking at what is behind you! If you are fearing whatever is chasing you, you have yet to activate your faith and let whatever devil in hell know that God is GREATER than any problem and His power surmounts and surpasses any perceived fear. When you walk in that knowledge, is there anything to be afraid of? What weapon can bring you harm? If you are still dwelling on the past, forgive yourself because God already has! We are human, we will fall short and make mistakes, but we do not have to stay there. Mistakes are only building blocks to become better and stronger. We fall so that we learn how to get back up. The past is just that… the past. If you are admiring yourself in the mirror, you have become stagnant and have shined a light on yourself that will dim. Life is ever evolving and you have to as well. Do not become too enamored or full of self. Life has a way of humbling us all and when we become too fixated on current accolades and allure, we inevitably come crashing down in a horrific fashion. It may seem cliché, but when you view life through your “windshield,” you realize how vast the possibilities become and how much road there is yet to travel. 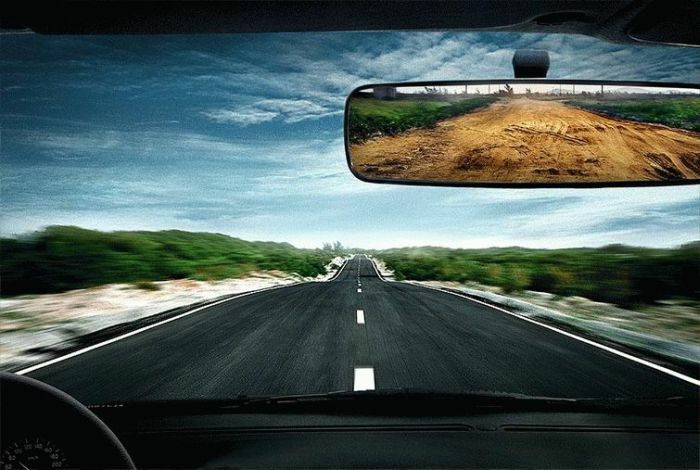 Looking through the “rearview” only reveals a limited, close, and very small part of life. Albeit important to know our history, learn from our past, none of us has to live in the days of old. Each waking day is a new opportunity to travel to unknown places physically and metaphorically speaking. Wherever we will allow our mind to travel, forward or in reverse, so will the rest of us, body, spirit, emotions, etc., follow. And we can only see so far ahead. Looking ahead is exciting and adventurous, but even the keenest eye can only see so far in front of them. The premise is to move forward, excited about what is ahead, but to enjoy the journey on the way. Learn from the past and become stronger and wiser because of it. Plan and be purposeful for the future, but do not rush it or be in haste. The past is already done, the future will take care of itself, and the present provides its own roads to traverse. Safe travels my friends!